On December 3, 2016, vibration testing automatically shut down early due to some sensor readings that exceeded predicted levels. After a thorough investigation, the James Webb Space Telescope team at NASA Goddard determined that the cause was extremely small motions of the numerous tie-downs or "launch restraint mechanisms" that keep one of the telescope's mirror wings folded-up for launch. "In-depth analysis of the test sensor data and detailed computer simulations confirmed that the input vibration was strong enough and the resonance of the telescope high enough at specific vibration frequencies to generate these tiny motions. Now that we understand how it happened, we have implemented changes to the test profile to prevent it from happening again," said Lee Feinberg, an engineer and James Webb Space Telescope Optical Telescope Element Manager at Goddard. 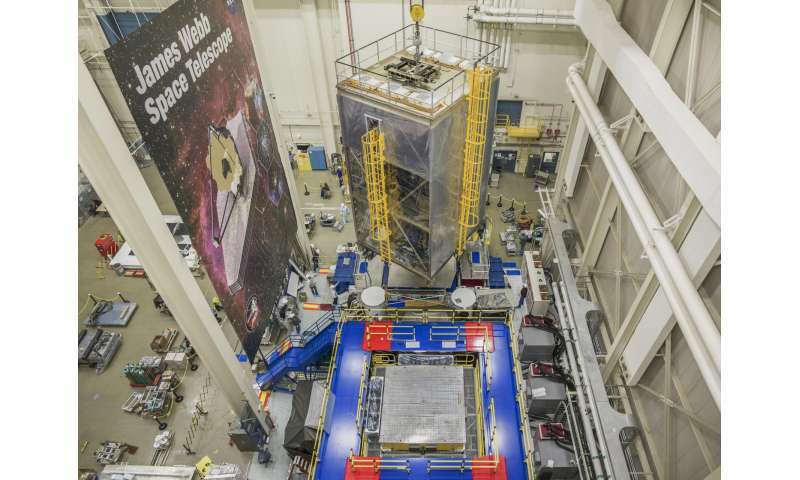 "We have learned valuable lessons that will be applied to the final pre-launch tests of Webb at the observatory level once it is fully assembled in 2018. Fortunately, by learning these lessons early, we've been able to add diagnostic tests that let us show how the ground vibration test itself is more severe than the launch vibration environment in a way that can give us confidence that the launch itself will be fully successful." The team resumed testing last week picking up where they left off in December. The test was successfully completed. Now that vibration testing along this one direction or "axis" is finished, the team is now moving forward with shaking the telescope in the other two directions to show that it can withstand vibrations in all three dimensions. "This was a great team effort between the NASA Goddard team, Northrop Grumman, Orbital ATK, Ball Aerospace, the European Space Agency, and Arianespace,­­" Feinberg said. "While we can now proceed with the current tests of the telescope and instruments." The James Webb Space Telescope is the world's most advanced space observatory. This engineering marvel is designed to unravel some of the greatest mysteries of the universe, from discovering the first stars and galaxies that formed after the Big Bang to studying the atmospheres of planets around other stars. Before the Webb is declared ready for launch, engineers and technicians rigorously test it to demonstrate all aspects of the mission and launch survivability. "Testing on the ground is critical to proving a spacecraft is safe to launch," Feinberg said. "The Webb telescope is the most dynamically complicated article of space hardware that we've ever tested." At Goddard, engineers test space hardware in vibration and acoustics test facilities that simulate environment to ensure that functionality is not impaired by the rigorous ride on a rocket into space. Rocket launches create high levels of vibration and noise that rattle spacecraft and telescopes. Ground testing is done to simulate the launch induced vibration and noise to ensure a solid design and assembly of the telescope before launch. "Due to its immense size, Webb has to be folded-up for launch and then unfolded in space. Prior generations of telescopes relied on rigid, non-moving structures for their stability. Because our mirror is larger than the rocket faring we needed structures folded for launch and moved once we're out of Earth's atmosphere. Webb is the first time we're building for both stability and mobility." Feinberg said. "This means that JWST testing is very unique, complex, and challenging." In addition to the mirror, many other parts of JWST must deploy, and each have their own unique set of challenges for testing and launch. NASA is working with ESA and their launch company, Arianespace, to ensure that the adjustments just made to Webb's vibration testing adequately envelopes the launch vibration environment, plus some margin. The mission continues to be on track and within budget for a 2018 launch. The most powerful space telescope ever built, the Webb telescope will provide images of the first galaxies ever formed, and explore planets around distant stars. It is a joint project of NASA, the European Space Agency and the Canadian Space Agency.